I have a very nice camera. And 91% of the time, I use my phone to take pictures. Today's post... all phone pics... which I try not to make a habit of. Before you get to see those though, write up a post of your own! Grab the html above, put it on your post of any five things, and link up below! Karli and I LOVE all of you gals! 1. | I'm not sure if you saw my post from Monday, but I'm going to be attending the Live Bachelor Finale on March 9. It is pretty pathetic how much this excites me. I have had more notice than when I went to the Premiere, so I have been planning my outfit a little more. 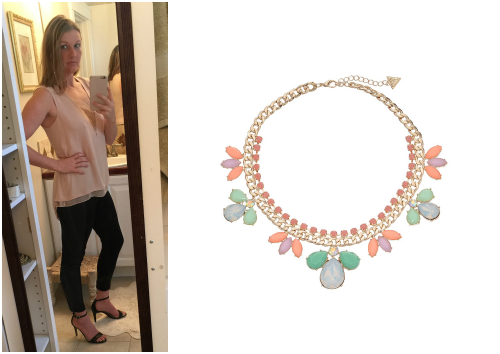 Leather tuxedo pants, deep-v pink top, statement necklace. I will probably choose 5 other outfits before I go. With the amount of thought I'm putting into this, you'd think I was going to be the star of the show. 2. | Last Friday I informed you all that I needed to do some better meal planning. I am happy to say that I was successful. I made the sweet potato nachos. Yum! 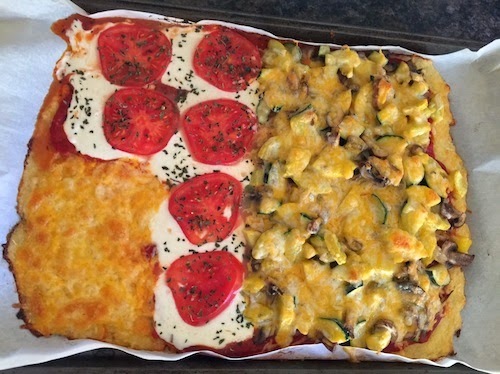 I also made a pizza with cauliflower crust. Delish. And I tried one of those one pot pasta dishes last night. So good. Now I just have to keep up this momentum. 3. | The wind has been whipping around here lately. This shouldn't surprise me, but I hate it. Keeping my wild boys entertained inside all day isn't always easy. Today, we did some finger painting in the bathtub however. Not only did they LOVE it, but it kept them busy for well over an hour. And then they cleaned it... and themselves up. 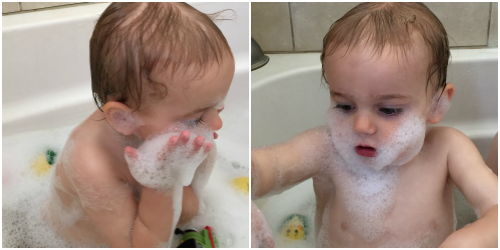 Side note: Beckam just discovered bubble beards. 4. 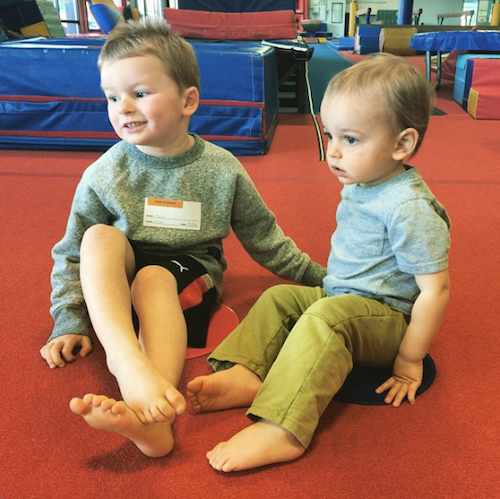 | This week gymnastics started up for my boys. Brody did it last year, and was beyond excited to do it again! Luckily, he is a by-the-books type of kid, and I know that he can follow directions, because I had to do Beckam's class with him. And now he thinks that our couch is a gym mat. He is fearless, and bound for the Olympics, or at least a concussion. 5. | Did you see that my sponsors and I are giving away $80 cash? Go ahead and get entered. 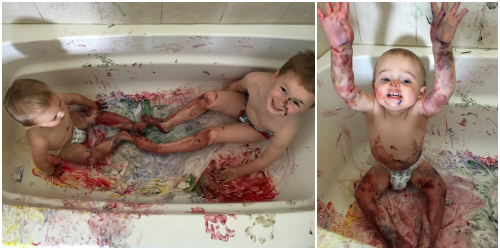 Do you use a special finger paint for the bath tub? That sounds like fun but I don't want a mess that doesn't clean up afterwards. i always forget about my good camera and use my phone too so when i actually use it I forget how good the pictures are! I love Cauliflower pizza-slightly less than I love regular greasy deep dish pizza, but a nice second best. The bathtub fingerpaints are genius and I am going to have to remember that when this little guy thats currently baking is out in this world and old enough for those kinds of activities! I do the same thing with my photos. The phone is just so convenient! Goodness...that mess! Looks like they had a ball! The pizza you made looks good and the sweet potato nachos sounds awesome! I will have to check out those recipes! Finger painting in the bath! Brilliant! I have been holding off on doing it with my daughter because of the mess factor. Cannot imagine all that paint on our kitchen carpet! Hahaha that finger painting party looks fun! I bet they enjoyed that! All of your cooking looks so good! Hope you have a great weekend!